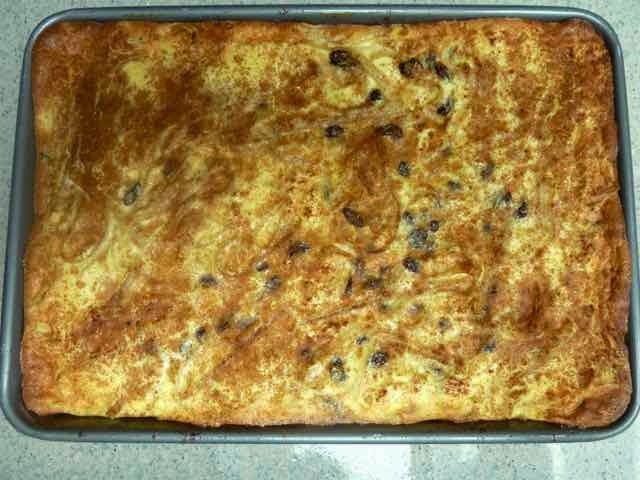 Noodle kugel is a typical Eastern European Jewish noodle pudding. Everyone has their own recipe and ideas of when and how to eat it. Some like it hot, some cold, some at room temperature. Some eat it with the main meal, some for dessert, some with breakfast (like a breakfast pastry), some for a snack. There are sweet and savory noodle kugel recipes. 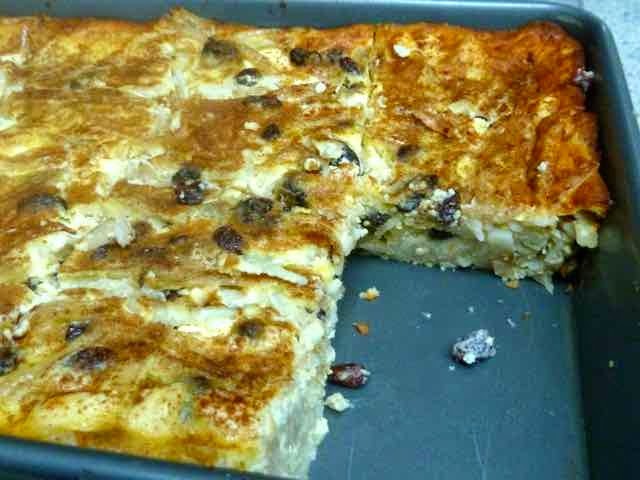 There are also other types of kugel such as potato, cabbage, carrot, etc. I always loved the sweet dairy noodle kugels best. I will eat it at any temperature and at any meal or time of day; it is that good! This recipe is made with lots of dairy and eggs. 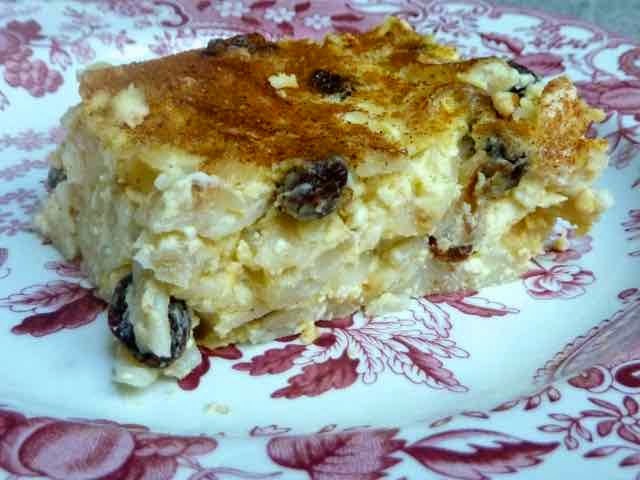 It is the best kugel I have ever eaten, even better than my Grandma’s (sorry Grandma). I converted a recipe from Tori Avery’s blog into a gluten free version. To make this the very best kugel, you must use the very best ingredients. For a gluten free noodle recipe the brand of noodle is key. 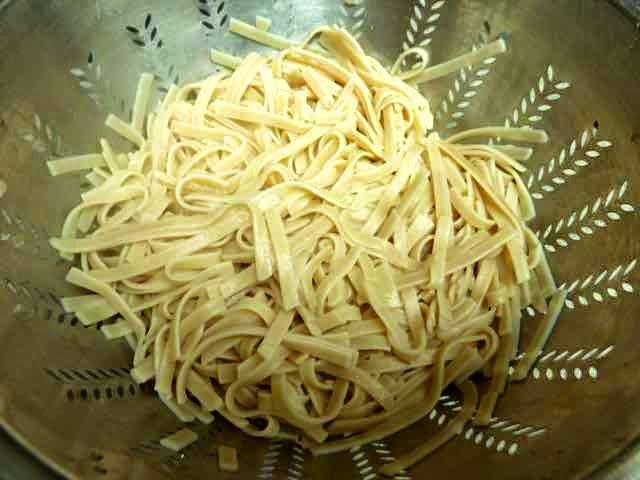 Usually, in the wheat world, egg noodles are used in this recipe. I have tried GF egg noodles that were store bought, but they were so inedible that I threw them in the trash. I can’t imagine they get any repeat customers with such an awful product. The taste and texture were similar to a lumpy paste made from ground up cardboard, total yuck! So instead of GF egg noodles I use my favorite brand of pasta, Tinkyada Pasta Joy. All their noodles taste great and have an outstanding texture. No one would ever know they were GF noodles. They are rice noodles and come in brown or white rice and organic or non-organic varieties. There are many shapes and even lasagna noodles. The company is Canadian. It is a bit more expensive than other GF pastas, but well worth it. For this recipe I used the fettuccini shaped Tinkyada noodles and broke them into thirds to be more the size of egg noodles than spaghetti. Since I don’t make it often, I decided to use the more expensive brands of dairy ingredients to have absolutely the very best kugel experience. I used Organic Valley brand cream cheese (full fat), butter & cottage cheese (low fat) and Green Valley sour cream. I love Organic Valley products, the taste is wonderful, like what dairy products tasted like in days of yore. Very flavorful and delicious. Green Valley is a newer company that makes lactose free sour cream. I don’t need the lactose free, but I need this brand of sour cream. I got a sample taste at a GF expo last September and was hooked. I have never tasted such an amazing sour cream. The flavor is so delightful that you can eat it plain like yogurt. I was never a big sour cream fan, but I am a fan of this brand. Kugel is a fairly easy recipe to make. You mix all the ingredients, except the noodles, together. You cook the noodles. Then you mix the noodles and all the other ingredients together, put it in a pan and bake it for 45 minutes - 1 hour. You do need to let it rest about 20-30 minutes after baking. If it is taken out of the pan right away the kugel will spread out and not stay together in neatly cut squares. GF Fettuccini Noodles - Tinkyada Pasta Joy brand is best. Break the noodles into thirds to be more the size of egg noodles. Preheat the oven to 350℉. Grease a 9x13 baking dish or pan with butter. Fill a large pasta pot with water, add some salt & a tablespoon of oil (to keep the noodles from sticking together) and bring to a boil. While the water is boiling add all the ingredients, except the raisins and noodles, to a large bowl and mix together well. A few lumps are OK. Some people put it all into a food processor and puree it, but I prefer the rustic texture with some lumps of cream cheese and cottage cheese that, when baked, become small clumps of “cheese Danish” sort of filling. Ingredients mixed together by hand. Note some lumps of cream cheese and cottage cheese. Add the raisins to the dairy and egg mixture and mix well. When the water boils, add the noodles that have been broken into thirds. Cook the noodles about 5 minutes less than the package calls for. Check the texture. You want the noodles al dente. Firm, with a little chew, but not crunchy in the center. If the pasta center is still crunchy cook another minute and check again. Repeat until the noodles are done. It is better if the noodles are a bit under done than over done because they will continue cooking while the kugel is baking and you don’t want mushy noodles. Drain and rinse with cold water to stop the cooking. Breaking the fettuccini noodles into thirds. 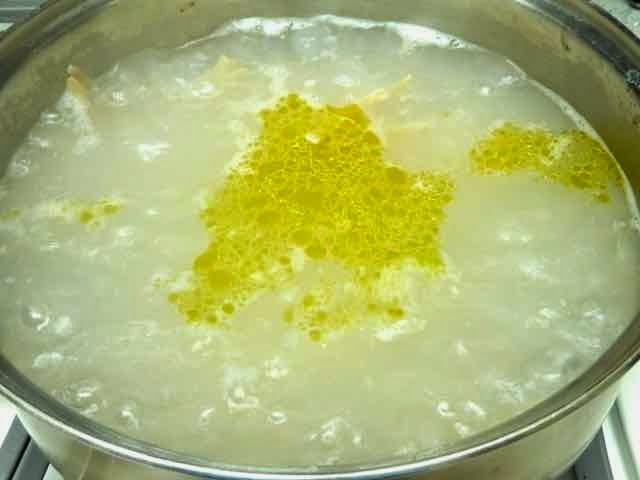 Boiling the noodles in water with salt and oil. 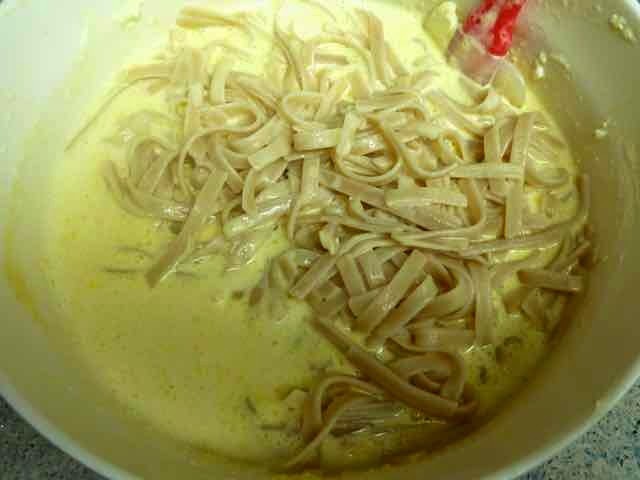 Drained noodles, after rinsing with cold water. Add the cooked noodles to the rest of the ingredients and mix in. Noodles added to the other ingredients. Noodles and other ingredients all mixed together. Sprinkle the top with cinnamon and, if desired, a little sugar. Cinnamon and a little sugar sprinkled on top of the raw kugel. Bake about 45 minutes - 1 hour. The kugel is done when the center is firm and the edges are puffed up and nicely browned. Turn the kugel half way through the baking time so that it will bake more evenly. If the top of the kugel is getting too browned at the half way point, then cover it loosely with foil to prevent further browning or burning. 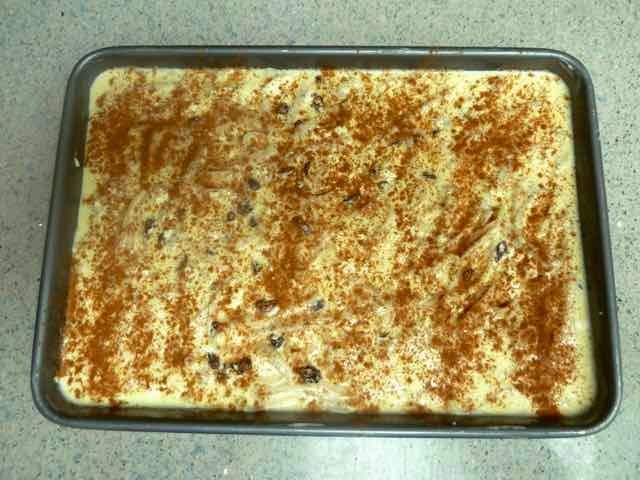 Allow the kugel to rest for 20-30 minutes before slicing and serving. 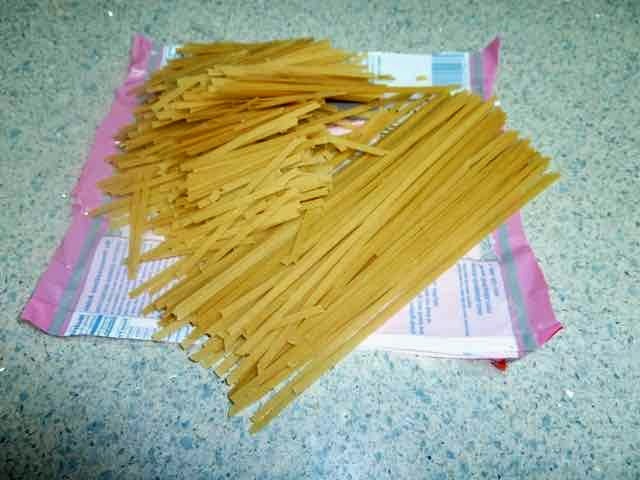 If you cut it right away the noodles will spread out instead of staying in neat pieces when cut. GF SWEET NOODLE KUGEL 1lb./1 package GF Fettuccini Noodles - Tinkyada Pasta Joy brand is best. Break the noodles into thirds to be more the size of egg noodles. 8 oz. Cream Cheese 1lb./2 cups Sour Cream 8 oz./1 cup Cottage Cheese 6 large Eggs 3/4 cup Sugar (I used evaporated cane juice crystals) 1/4 cup/2oz./4 Tbs. 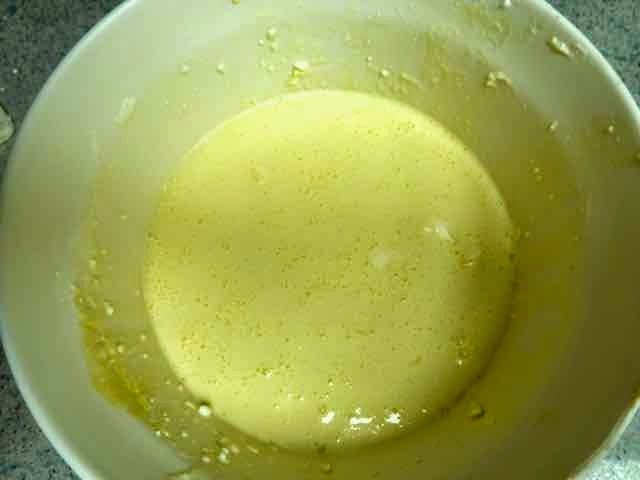 Unsalted Butter - melted 1/4 tsp. Himalayan Sea Salt. 1 cup Raisins For Dusting Cinnamon and Sugar Directions Preheat the oven to 350℉. 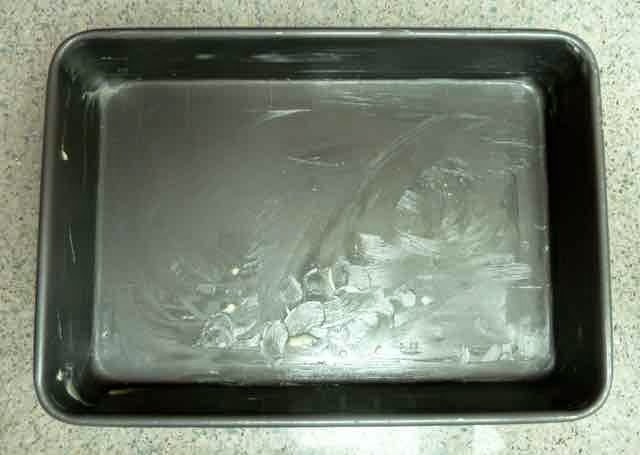 Grease a 9x13 baking dish or pan with butter. Fill a large pasta pot with water, add some salt & a tablespoon of oil (to keep the noodles from sticking together) and bring to a boil. 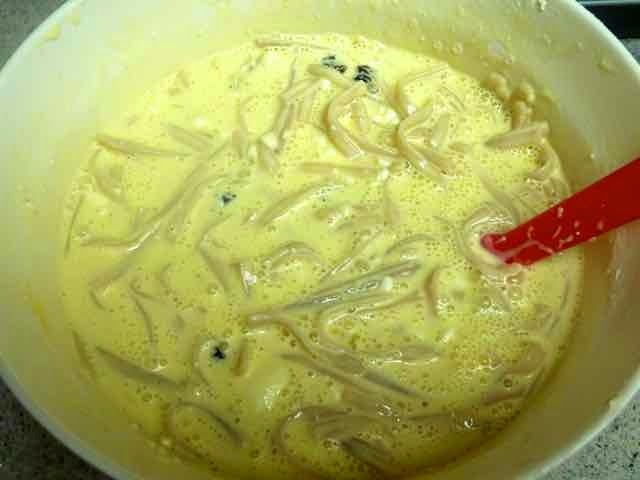 While the water is boiling add all the ingredients, except the raisins and noodles, to a large bowl and mix together well. A few lumps are OK. Some people put it all into a food processor and puree it, but I prefer the rustic texture with some lumps of cream cheese and cottage cheese that, when baked, become small clumps of “cheese Danish” sort of filling. Add the raisins to the dairy and egg mixture and mix well. When the water boils, add the noodles that have been broken into thirds. Cook the noodles about 5 minutes less than the package calls for. Check the texture. You want the noodles al dente. Firm, with a little chew, but not crunchy in the center. If the pasta center is still crunchy cook another minute and check again. Repeat until the noodles are done. It is better if the noodles are a bit under done than over done because they will continue cooking while the kugel is baking and you don’t want mushy noodles. Drain and rinse with cold water to stop the cooking. Add the cooked noodles to the rest of the ingredients and mix in. Pour into the prepared pan. Sprinkle the top with cinnamon and, if desired, a little sugar. Bake about 45 minutes - 1 hour. The kugel is done when the center is firm and the edges are puffed up and nicely browned. Turn the kugel half way through the baking time so that it will bake more evenly. If the top of the kugel is getting too browned at the half way point, then cover it loosely with foil to prevent further browning or burning. 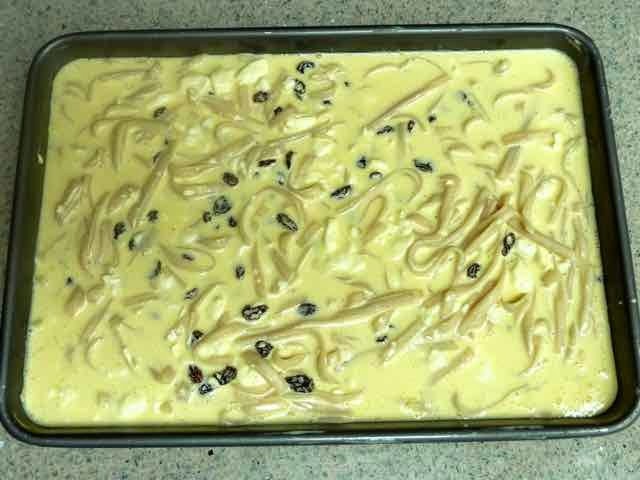 Allow the kugel to rest for 20-30 minutes before slicing and serving. If you cut it right away the noodles will spread out instead of staying in neat pieces when cut.